Close to the cathedral (10 min walk) and the main activity but away from the hustle and bustle. Where to find Santiago de Compostela hotels near an airport? How can I find hotels in different Santiago de Compostela neighborhoods? Where can I find hotels in Santiago de Compostela that are near tourist attractions? 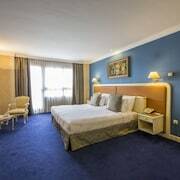 If you are vacationing in the La Coruna area and you're after accommodation in Santiago de Compostela, you'll find a wonderful array to choose from. Within our comprehensive accommodation pages you'll discover 95 accommodation choices within 0.1 kilometres (0.06 miles) of Santiago de Compostela's center. 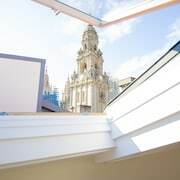 The Parador de Santiago - Hostal dos Reis Católicos and San Francisco Hotel Monumento are some of the most centrally located accommodation options in Santiago de Compostela. Villestro is an accommodation area that lies 5 kilometres (3 miles) from the center of Santiago de Compostela and offers 2 Expedia-listed hotel options. Places to stay in Villestro are the Hotel O Desvío and O Asador de Roxos. The Santiago de Compostela Cathedral is one of the more famous attractions in Santiago de Compostela. The Hotel Spa Relais & Chateaux A Quinta da Auga and Rusticae Altaïr Hotel, are within a 0.1 kilometres (0.06 miles) radius of Santiago de Compostela Cathedral. The Obradoiro Square and the Museum of the Galician People are popular Santiago de Compostela, attractions and many visitors choose to stay close by. The Rusticae Moure Hotel and the Hotel Montenegro are amongst the hotels that are closest to the Obradoiro Square. 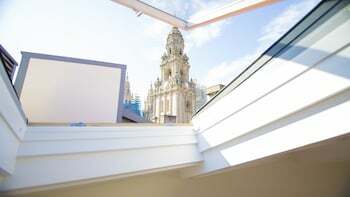 The AC Palacio del Carmen, Autograph Collection and the Eurostars Araguaney are closer to the Museum of the Galician People. Expedia fully appreciate that all travelers possess varying budgets. So if you're seeking accommodation at the cheaper end of the range, the Santiago de Compostela area features some nice options to choose from. 1 kilometre (1 mile) away from Santiago de Compostela's heart is where you'll find the Hesperia Peregrino. The A Tafona do Peregrino is only 0.6 kilometres (0.4 miles) away. The Pensión Mafer Bed & Breakfast and the Nest Style Santiago are amongst the other lower-cost places worth looking into. 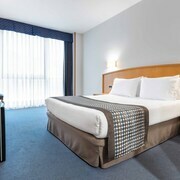 0.1 kilometres (0.1 miles) away from the heart of Santiago de Compostela, is the Compostela Hotel. The Hotel Virxe da Cerca is located 0.5 kilometres (0.3 miles) away. 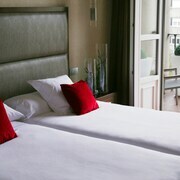 Some other hotels and apartment options are the Hotel Carrís Casa de la Troya and the Hotel Rua Villar. Looking for things to do? Spend the day visiting Herrera Garden and Church of San Francisco, which you'll find in Magdalena, 70 kilometres (45 miles) to the north of Santiago de Compostela. 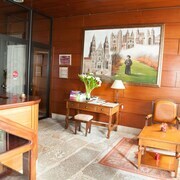 The Parador de Ferrol and Hotel Odeón are some of the apartment and hotel alternatives in Magdalena. Or, you could consider staying in La Coruna Old Town, 55 kilometres (35 miles) to the north of Santiago de Compostela, where you'll find the Hesperia Finisterre and Santa Cristina. The Maria Pita House Museum and Church of Santiago are just a couple of the more popular points of interest to check out should you visit La Coruna Old Town. If you are planning on arriving through Lavacolla Airport, you may like to stay at Ruta Jacobea, or Pazo Xan Xordo, both of which are a short taxi ride away. 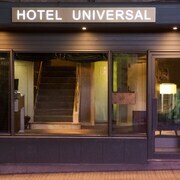 What are the most popular Santiago de Compostela hotels? Are there hotels in other cities near Santiago de Compostela? 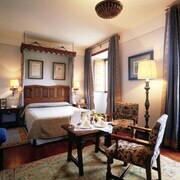 What other types of accommodations are available in Santiago de Compostela? Explore Santiago de Compostela with Expedia.ca’s Travel Guides to find the best flights, cars, holiday packages and more!